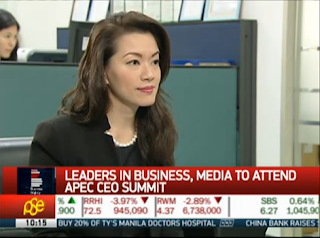 ABS-CBN News Channel's Cathy Yang has been chosen to be among the moderators at the upcoming APEC CEO Summit 2015. Yang, the only Filipino in the pack of international journalists, will be joining the likes of Richard Quest and Andrew Stevens of CNN; Norman Pearlstine and Zoher Abdoolcarim of Time Inc.; Trefor Moss of The Wall Street Journal; Timothy Ong of Asian Inc.; and Haslinda Amin of Bloomberg Television. The Market Edge anchor, who has been making news these days with her big interviews with business leaders, will be leading the fifth session of the forum, with a focus on the "Health and Education for the Future." Among the participants at the fifth session are the following: Peruvian President Ollanta Humala; Freeport-McMoRan CEO Richard Adkerson; JP Morgan Asia Pacific CEO Nicolás Aguzin; and Sanofi Pasteur CEO Olivier Charmeil. The forum will run from November 16 to 18 and will be held at the Makati Shangri-La Hotel.